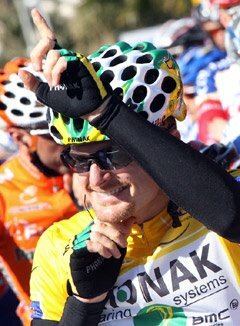 In case you hadn't heard, American Floyd Landis became just the fifth American in Tour de France history to don the coveted Maillot Jaune, or Yellow Jersey, that designates the overall race leader. He gained that privilege by finishing an incredibly difficult stage on Thursday in the Pyrenees mountains near Spain. Landis, a former teammate of Lance Armstrong, finished with a group of three riders that included American Levi Leipheimer well ahead of all other top Tour contenders. He kept the Yellow Jersey at the end of today's stage. MENNONITE ROOTS. Landis originally hails from Lancaster County, Pennsylvania, the son of strict conservative Mennonite parents. Landis loved and focused on cycling as a youth. He moved out of his Mennonite community to San Diego and became the National Jr. Mountain Bike Champion before moving over to road racing. He rode with Armstrong on three of his Tour de France victories before becoming leader of the Swiss Phonak Hearing Systems team. Last year, Landis finished 7th in the TdF. Landis is described as the antithesis of Armstrong in every way but one--they share in intense passion for winning the Tour de France. HIP REPLACEMENT PENDING. What makes Landis' current Tour de France effort interesting is that he has a degenerative hip that needs to be replaced following the Tour. He had a hard fall in 2003 and his hip never fully recovered. He reports that he rides through a lot of pain. Whether or not Landis finishes first in Paris, one has to appreciate what he's attempting to do with the condition that he's bearing. I hope he wins. HAVE FUN WITH THE TOUR. Below are a few quick links that can bring you up to speed on this year's Tour de Fance and make it fun for you. Full results of each Stage by Cyclingnews. This link gives you a rundown on overall rankings in each jersey category, too. Think of the Tour de France as a series of 21 stages like the NASCAR Nextel Cup series has many races with individual race winners and one champion at the end of the series. Scroll easily through lots of pages of really great Tour photography at Yahoo! OLN provides free video highlights and commentary wrap-ups of each stage by Bob Roll and Al Trautwig. Listen to the next stage live at: http://www.cyclingfans.com/ This site provides a link to Eurosport's live audio coverage of the Tour. Audio coverage usually begins at 6 or 7 AM each day. Limited Internet TV viewing is also accessible at this site. AMERICANS TO WEAR YELLOW. Who are the other Americans who have had the privilege of leading at least one Stage of the Tour de France? Greg Lemond (won the race 3 times), Lance Armstrong (won the race an unprecedented 7 times), George Hincapie (wore the Yellow Jersey after Stage 1 of this year's race), and Bobby Jullich (wore it for a stage eight years ago).